in order to satisfy customers' needs. source to a domestic retail store even more swiftly and reliably. Takasue group, since established in 1902, have striven to improve logistics services to the highest quality, consistently satisfying the various needs of our customers. Consequently, the range of our services has expanded from trucking business to operating distribution center, on-site contract manufacturing services, dispatching logistic engineers, providing brokerage services through internet, and international 3PL (third-party logistics) services. In order to provide services which may exceed customers' expectation, we continue every effort to utilize our know-how which has been accumulated through operating logistic business over the past century. We desire to become your good partner which make comprehensive suggestion to improve your logistic operation, as well as to satisfy various needs timely and appropriately in the daily operation. Founder Suematsu Takamura started running two carriages. Entered into trucking business as Takamura-gumi. Changed company name to Takasue Corporation. Built the new headquarters building in Atsuta-ku, Nagoya. Established Japan Logistics Consultants Corporation. Established TAKA (SHANGHAI) Co., Ltd. Separated the trucking division as Takasue Express Corporation. 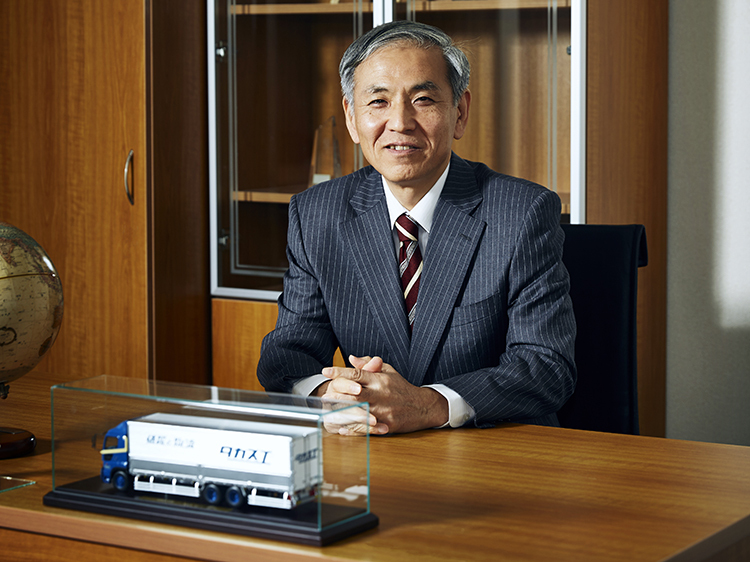 Established Tokai Container Transport Co., Ltd. as the joint venture with Suzue Corporation. Established Takasue Transport Corporation as the joint venture with Japan Transcity Corporation. Reorganized Takasue Corporation Group in Japan. －Split Takasue Corporation into “Takasue Holdings Corporation” and “Takasue Corporation”. －Combined “Takasue Corporation”, “Takasue Express Corporation” and “Japan Logistics Consultants Corporation” into one corporation named “Takasue Corporation”. Delivering the right product to the right place at the right time. Takasue group perform just-in-time transportation and delivery services faithfully based on the principles of safety, reliability and speed. We start with those principles. We have a delivery network of our own made up of more than 50 logistics bases throughout the Central Japan region, and outside of this area. We have built consolidation services, so-called "Takasue Lot" through partnerships with other companies. Takasue group optimize the whole logistic process starting from filling/packaging the product at the origins, transferring to distribution centers, short term storing and finally delivering to final retailers. We develop 3PL information system to meet our clients' needs including order process capabilities. We repeat as necessary to undertake the optimum inventory, replenishment needs and allocation for our clients. In addition, we prepare management reports for constant review and improvement of the supply chain. Takasue group help improve clients' productivity in their plants by means of such services as the transportation of raw materials, intermediate materials, as well as line operations, process control and warehouse management. We provide high-quality and high-efficiency operations support by fully utilizing the operational technology and expertise that we have accumulated over many years. We always seek to strengthen our clients' competitiveness. Takasue group offer a comprehensive range of value-added logistics services for import and export shipment forwarding with our own customs broker licenses. We ensure a smooth shipment for all clients' cargo, making quick handling of import/export procedures, document preparation and fleet arrangement. As forwarding agent, Takasue group with experienced staff are capable of offering H.B/L agency service to foreign independent agents. We can offer all the usual services, such as, to send arrival notice to importer, to collect original B/L and any ocean freight and charges due, to send collected funds to you after collection, to pay any funds required by the line on their behalf, and so on. FEATURE of TAKA(SHANGHAI) Co., Ltd.
Takasue group entered into international forwarding business in earnest since the first foreign subsidiary of TAKA(SHANGHAI) Co., Ltd.
eatablished in 1994. TAKA(SHANGHAI) Co., Ltd. have engaged in bonded warehousing and truck transporting by their own assets as well as forwarding business in China. Copyright © TAKASUE All Rights Reserved.